"Each day is a gift. You know you really realize that when you get older," says Don. 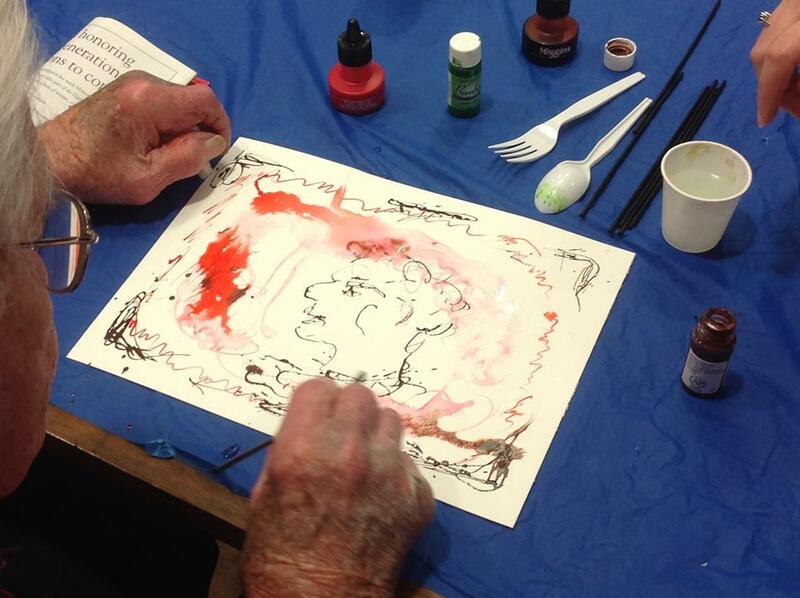 Don is one of the many people with Alzheimer's disease participating in the Bringing Art to Life art therapy program at the University of Alabama (UA)- Tuscaloosa. Now in its fifth year, Bringing Art to Life is a special elective Undergraduate Honors course at UA. Developed by neurologist, Daniel C. Potts, M.D., F.A.A.N., in collaboration with the Undergraduate Honors College, and art therapists, including me, Bringing Art to Life gives undergraduate honor students, coming from diverse majors, an opportunity to spend a semester learning about Alzheimer's and related dementias. Intensive learning comes from both on and off campus as students spend each week getting creative with Art Therapist, Carrie Ezell, who facilitates the art therapy sessions for persons with dementia that are in need of support. The response from students with and without a personal connection to Alzheimer's has been overwhelmingly positive. Firsthand they see how art therapy and creativity help those with dementia, including Traumatic Brain Injury (TBI). Dr. Potts was inspired to create Bringing Art to Life after watching his own father, Lester Potts, suffer from rapidly progressing Alzheimer's. As Lester became increasingly agitated, the one ray of hope they found came from Lester's experience at Caring Days, an adult day center. At Caring Days Lester was introduced to George, an artist who volunteered his time and talent to those in need. With George's help, Lester began to paint. In their sessions, this Alabama saw miller who never showed an interest in art, found his hidden talent. Painting gave Lester purpose and it gave him an outlet to communicate with his family. The process of making art helped soften the emotional hard edges of Alzheimer's disease that had been building up. Meaning, creativity and a connection to society, enabled Lester (as it does for many others) to have a better quality of life again. Because of art therapy, Dr. Potts was able to reconnect with his father. As a neurologist who specializes in Alzheimer's, the experience led him to become an advocate in combining art and neuroscience. "The course [Bringing Art to Life] was the perfect fit for the UA Honors experience." Dr. Potts explains, "It combines service learning with the arts and humanities, and builds intergenerational relationships involving students of diverse majors, and invites collaboration among various disciplines and organizations in the community. I think the game changer, if we want culture change regarding the way our society stigmatizes those with dementia and mental illness specifically, and any so-called "disabilities," in general, is to grow empathy in our young people. If they can get inside the skin of people that have these conditions, touching the pain will unleash the hope for a better way, and create the impetus for change." As the prevalence of Alzheimer's disease rises, so too does the need for education and training. We need to equip our students with extensive knowledge beyond basic fundamentals. Concludes Dr. Potts, " [Bringing Art to Life] will combat ageist attitudes through fostering intergenerational relationships characterized by compassion, respect and understanding. If programs like this were available on a widespread basis, I think our society would become more inclusive and compassionate. Programs like, Bringing Art to Life are particularly important for those who are going into health related professions, and in my experience, can completely change the motivation and outlook of providers, helping to guard against burnout later in their careers." As an art therapist, Alzheimer's clinical trials researcher and professor working in dementia, I find the course has another important benefit to spotlight: being cross discipline and open to a variety of majors, it allows students in non-medical disciplines to participate and gain valuable knowledge and experience they otherwise would miss. Feedback from students going through the program has been stellar. Maggie Holmes is one student at UA that participates in the Bringing Art to Life course. Maggie's own grandmother has Alzheimer's and their relationship has changed because of Bringing Art to Life. Explains Maggie, "Sometimes when I would be with her, I wouldn't be as understanding as I should be. However, after a few of my art therapy sessions, I felt as if I became more patient and supportive." With Bringing Art to Life, Maggie developed the skills to interact with her grandmother. "I salvaged my relationship with my grandmother while there was still time left. I learned to love my grandmother as she was in the moment and not to think of her as someone suffering from dementia. I'm so thankful for Bringing Art to Life for helping me to improve my relationship with my grandmother and for encouraging me to establish and create fond memories with her before she passed away." Other students have shared similarly profound experiences. Jessica Fults a UA pre-med student was drawn to the course by how patients and caregivers interact. "My participant [in the art therapy session] had volunteered at a community center for decades. In the short time I knew her, she made a profound impact on my life. Her courageous spirit and the kindness and gratitude she always displayed are things I will not forget. She showed what it means to truly care for others by the way she shared her heart for people." Bringing Art to Life is proving to be a great way to train a new generation, and enrich the connections with one in its twilight. Former student, Renee Stullich, sums it up well, "While my gift to her [the participant] was a [memory] book about her life, her gifts to me were much more valuable. [This] humble woman in front of me had once served as a Head Start Director, where she provided families with access to the resources necessary to live comfortably. After learning about all she did to better the greater Tuscaloosa community, I felt the desire to try to be more like her and put others first in my life. So often, I become so absorbed in my own life and forget how good it feels to spend time on other people. She served as a reminder that people are defined by far more than their illness. As my hand guided hers in creating art, I felt her become more comfortable." Renee concludes, "Connections aren't always made by what you say to one another, but rather by how you show you care. Despite our differences in age, race, and life experience, I was able to call this woman my friend, and I believe that speaks volumes about how Bringing Art to Life brings people together. The wisdom [my participant] imparted on me in our time together is invaluable and something I will carry with me on my journey to becoming a doctor."